CD4+ T cells represent the majority of T lymphocytes in the secondary lymphoid organs. They preferentially recognize HLA Class II and their activation leads to their differentiation into subsets depending on the context of the stimuli. 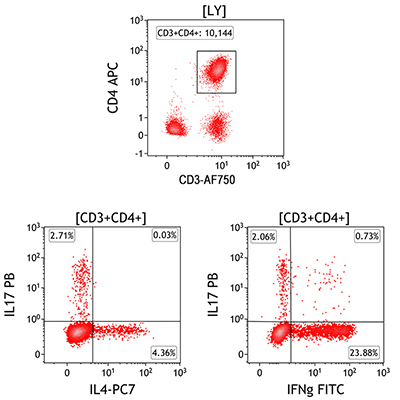 Activated CD4+ T cell subsets can be identified by their signature cytokines like IL-4, IL-17A and/or IFN-γ which are important for their helper cell functions. Detection of Th1/Th2/TH17 signature cytokines in T helper cells.